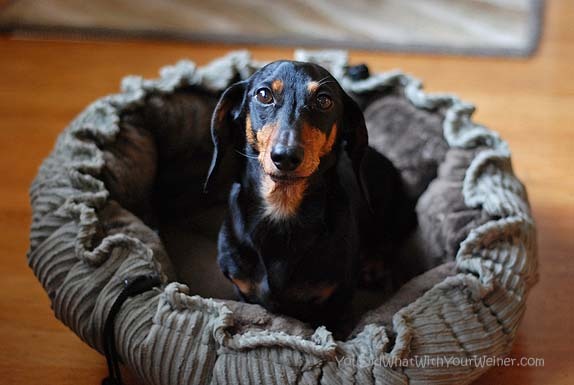 Last Wednesday I posted a photo of Gretel hogging the dog bed. Now, that is not the only bed in the house. There are two others plus the couch. This just happens to be the favorite one. I have this habit of getting one of everything even though I have two dogs. I guess it is usually fine because it only takes one dog to shun it or tear it up for me to tell that it was a waste of money. However, if they love it then I feel bad because one always looks sad when the other has it. This bed falls into the latter category. They both love the bed. If Chester is sleeping in the bed, Gretel will walk up to him and stare at the bed. She will trick him out of it sometimes too. Gretel will go into the kitchen and sit on her “I need to go out” rug and look at me. When I get up and walk into the kitchen Chester gets up and follows me. It’s usually to see if I am getting food rather than needing to go out but the point is that now he is out of the bed. As soon as he gets up, Gretel runs into the other room and climbs in the bed. So what “special dust” does this bed have? 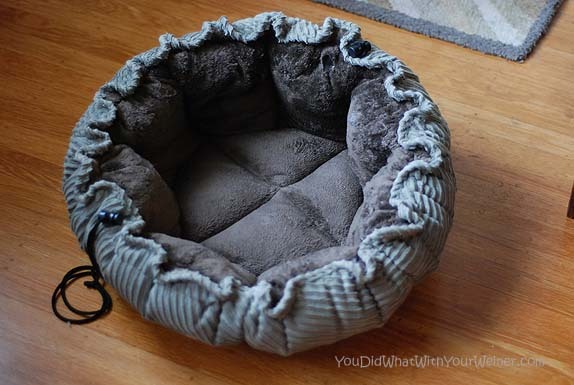 This Bowser Buttercup Bed has a drawstring around the edge that allows you to cinch it up into a little “cup”. It creates the perfect little doxie nest. It’s also really soft. Is there a favorite “spot” or bed at your house? They come in three different fabrics: a recycled Eco-Fleece, synthetic lambswool and microfiber (we have the microfiber version). 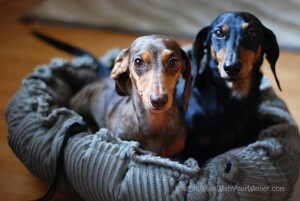 I decided this bed was something we needed two of so I got another one as a Christmas gift for Chester and Gretel. I consider it for both of them because now they will both have one to lay in and no one has to feel left out or trick each other to get into it. That bed looks super comfy for a little dog! That is funny. When I lived in my house Tiki would have a antler that Lana wanted (it doesn’t seem to matter how many I have, they still fight over one). Tiki would lay in the hallway to gnaw on it, Lana would look at her, go through the kitchen into the living room then back into the hallway and smell her bum. That distracts Tiki and Lana comes in for the antler and runs away. Stubborn little ones, but so smart and clever when they want something. It looks like a pretty nice bed! I’m laughing about the size large being for a fifteen pound dachshund. Bunny is small to me at fifty pounds! Cozy! and with a bumper all around, they must be in heaven. I’d try it out but all three of mine would try to jam themselves into it. Too bad it doesn’t come in extra large. Ya think they make em’ for a 58lb Airedale?! Yeah, probally nots, butts your bed looks really comfy! No wonders the doggies comspire to hog it. I have a favorite memory foam bed with a extra durable denium cover (nots that I NEED it or anything…). That is a super adorable, super comfy bed! great post. now they both have a bed they will still want the one the other one is laying on. happy sunday. That’s sounds like a great bed! It’s funny because ever since TeKeela was overgrown by her little bother and she is not longer the strongest, she will behave very similar to Gretel. They both will want the same thing even though there’s two of almost everything. She will show him another toy, invite him to play and trick us to let her out just to make him leave whatever he was doing. It’s funny that is the only plotter. He would just take whatever he wants as soon as she gets distracted, but will never fool her. Jokes on you! If your two are anything like MY two, they don’t want two identical beds, they both want that ONE ORIGINAL BED. I spent a woof load of money on our second bed and no one uses it. They’d rather scrap over the one. DOGS! Looks like a nice bed! Eleanor is such s spoiled princess she will never sit or lie on the bare floor. She even has to eat on a rug! So she has a bed upstairs and down! I have two dogs with mix matched personalities. My medium sized Shepard mix, Penny, sees herself as a lap dog, and enjoys sleeping in my dauchsund mix, Pickles’s bed, while Pickles prefers Penny’s large bed and fancies himself a St. Bernard. He has a big personality and ego to match. They are both endlessly entertaining.